Behind the choir stalls on the north side, is the only old brass in the church. It is John Richmond and his two wives, Joan and Christian, 1530. “Pray for the souls of Johanis Rychemond and Joanne and Christiane his wives ….”. The Richmond monument was in the old church and was destroyed during the Reformation. This fragment of brass was recovered in 1907 from Devonshire, the Monumental Brass Society tracing its origin back to Harwich. The will of John Richmond is lodged at Somerset House. In it he desired to be buried within the church of St Nicholas “nere my wyf” (Joan), and left money to bring fresh water in pipes of “ledd” from the springs of Dovercourt to Harwich. This was built by Flight and Robson of London, who were well known for their major work, especially the famous Appolonian organ. 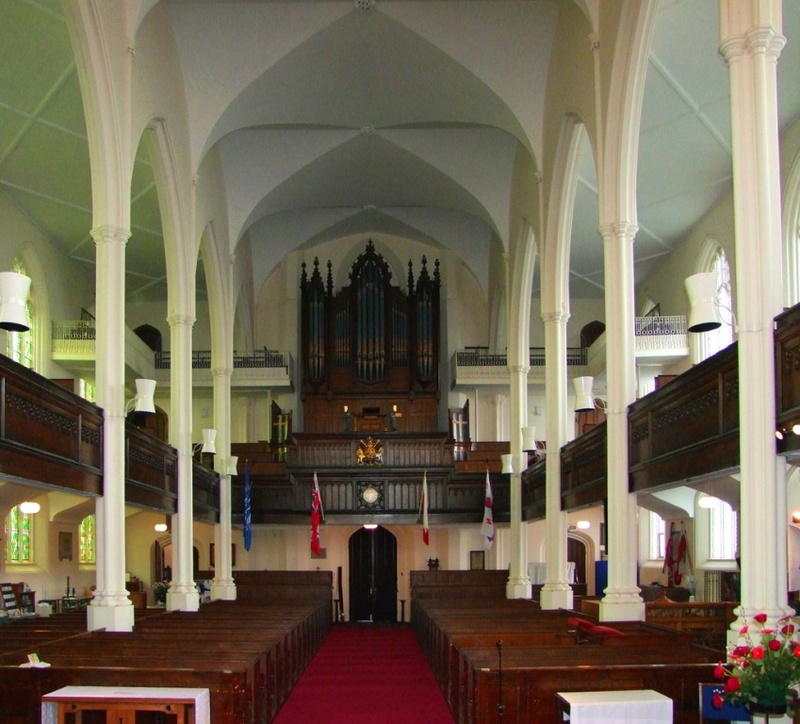 The accounts for the building of the church show that Mr Flight was paid £445 for the organ. There is a tradition that the instrument was packed and despatched to Harwich in a barge but the barge sunk in the harbour during a storm. The organ parts were salvaged and appeared none the worse for their immersion in salt water. One of its most interesting features in a cornet stop. The front pipes are neatly encased and the whole effect is very pleasing. The organ was completely restored in 1992. High up on both sides of the organ are the ‘cages’, quite unique, into which the school children were packed in days gone by to form a heavenly choir. This was before the choir stalls were placed in the chancel around 1870. The cages are now kept locked for reason of safety but an excellent view of the interior of the church can be obtained from the lower gallery. Beneath the organ are the Arms of King George IV who gave £1000 towards the rebuilding of the church. They are the handsomest in the county. This is positioned beneath the Royal Arms and recently replaced one made by Harwich clockmaker J Brown in 1821, the gift of Captain George Deane. This is in the Nave and is unmistakable with its red cord and velvet cushions and the rest for the Borough mace. This can be seen in an oak case to the right of the altar in the Lady Chapel. It was presented by Mr and Mrs T Jennings in 1936. It contains the Geneva version of the Old Testament by Theodore Beza, ‘Englished by L Tomson’. It includes the Apocrypha. 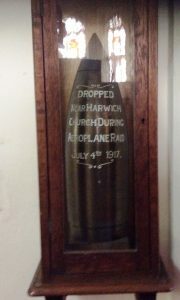 In a glass case at the rear of the church is the head of an aerial torpedo, which narrowly missed the church during a Zeppelin attack in 1917. There was originally a peal of six bells cast in 1752 by Thomas Gardiner of Sudbury but they were taken out of the old church and recast in 1821 by Mears and Stainbank of the Whitechapel Bell Foundry when two trebles were added. The external face is inscribed ‘Newell of London 1821’ but the mechanism, dated 1799, made by John Thwaites of London, probably came from the old church. The church is open during the Summer months.